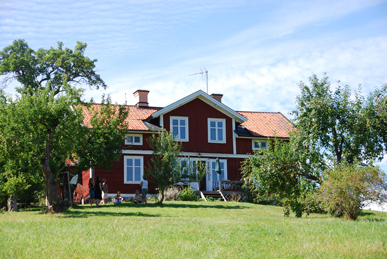 Last Fall, I attended a course, "Function of the Singing Voice", graciously hosted by Prof. Johan Sundberg and his wife, Dr Ulla Sundberg (phonetics & linguistics) at their lovely Summer home south of Stockholm. Since I'm an engineer by training and profession, this approach to singing feels absolutely natural, and I am convinced that a more systematic understanding of the science behind singing only helps me become a better singer. In general, it was great fun to get an introduction to what we can describe scientifically about the voice. There are many things which we cannot easily measure, and there are obvious problems with just about all experimental setups. Still, there is a wealth of extremely useful knowledge, which I think every singer could benefit from. How to shape vowels (and the inherent problem for sopranos - see below), is a very obvious example. The singer's formant is of great importance for male classical singers. The main reason is that it helps the singer to be heard above an orchestra. For rock and musical singers, it offers no such benefits, as the music usually has a different frequency spectrum, and the singers rely on amplification to make themselves heard. Sopranos cannot produce much of a singer's formant, but don't strictly need to, as they make themselves heard anyway. A number of different techniques exist for creating a singer's formant, e.g. raising your tongue towards the palate will help modify the third formant (but of course also affect articulation), but the "natural" way of producing it is by lowering the larynx and enlarging the ventricle (epilarynx resonator) above the larynx. This is also described pretty well here. The obvious main challenge for sopranos is making sure that the fundamental frequency, f0, doesn't rise above the first formant, f1. This is called "resonance tuning"), and one of the main techniques is raising f1 by increasing the jaw opening. Essentially, sopranos have little chance of getting the vowels right in their upper range, mainly because the fundamental frequency is well above the frequencies that shape the vowel sounds, and the formants which normally shape the vowels must be kept above the fundamental frequency for a pleasant sound. The course helped clarify my understanding of how vowels are shaped, which has helped me in my practice (making me use the tongue more deliberately for articulation), and the notion of "tracheal pull" has helped me control air pressure and timbre - for example by noting that I can help the tracheal pull not only by lowering the diaphragm, but also by expanding or raising the chest, thereby either allowing the lungs to expand outward, or simply increasing the vertical room by "raising the ceiling", rather than "lowering the floor". I did note with some disappointment, however, that there exist no good techniques for understanding the higher formants (it was only stated that they are generated in the larynx, and affect the "personality" of the voice). I noted with interest slides 29-32 from these seminar slides, where the spectral analysis charts for Corelli and Pavarotti show some similarity, as do the charts of Bjoerling and Domingo. I will draw no further conclusions. Overall, it was a wonderful week, with great lectures, wonderful food, interesting labs and very good company. It was interesting to know about resonance tune which is important in singing.